Fear. Hatred. Xenophobia. Paranoia. Jingoism. Isolation. Zealotry. Bellicism. Ethnocentricity. And bigotry. 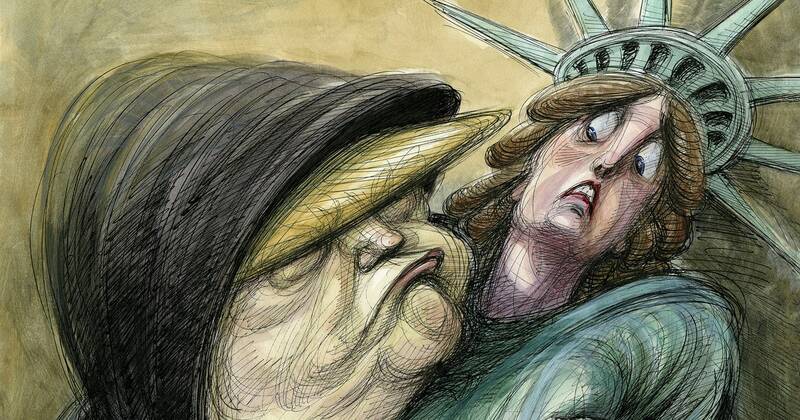 I woke up this morning not to any kind of “New America” but to an America that has finally allowed its baser instincts to chew through the leash on which they have been held for many years and take charge. I woke up to the stunning revelation that, when push comes to shove, it is not our humanity that wins the day. It is our fear. America fears its lack of respect on the world stage. It fears its diminished hegemony. It fears attacks from people it has long vilified. The nation has voted to validate these fears by putting forward a man who fosters them. Donald Trump is not a hate-monger. He is not a force of evil. He is only someone who took the pulse of the nation and discovered that it was racing toward a heart attack. He is a reflection of us all. As a blogger, I take note of the fact that I have not blogged anything for many months. I have allowed many things to wash over me with shrugging shoulders. I have started to say to myself – what’s the point? Nothing changes. The train passes and the dogs bark. In the post-election daze, when there is nothing left to do but wait and see what our new cowboy commander-in-chief will do, it seems the wrong time to start blogging again. The time for opinions and positions that could have had any sway is surely over now and for another four years. This is the bed we made. This is where we must sleep. But on further analysis, it is not time to sleep. It is rather a time to reassess a world that allows for the Donald Trumps to triumph. I am not convinced we need more fear and prejudice to “make America great again.” We seem to have that in prodigious quantities. We need more courage, more conviction, and more reason. I cannot say I am pleased with the election outcome. But I am not sure I would have been more pleased with the alternative. In a ship of 324 million souls, surely we can find a choice of better pilots. Why not dig a few up for 2020? This entry was posted in Essays and tagged America, bigotry, blog, Chris Farmer, commander-in-chief, Donald Trump, elections, fear, nationalism, The Standard Deviation, US. Bookmark the permalink. “surely we can find a choice of better pilots” – No!